ActiveBuilding is a collaborative, paperless, and social property management solution. It allows you to communicate with all of your residents or send messages to particular persons or groups. Other than that, the solution has a social network embedded in it where residents can create profiles, share recipes, and plan for community activities together. Additionally, ActiveBuilding helps your staff focus on things that matter. With the application, you can keep track of and prioritize maintenance tasks digitally, eschewing papers in the process for easy filing. Moreover, your front desk personnel have a variety of tools they can employ in keeping residents secure and on top of their packages. Streamline your communications with your tenants via your lobby display. Utilize your screen to broadcast announcements about maintenance, service updates, and socials. With ActiveBuilding, you can do this with ease. That is because there is a button that lets you connect the application to your public monitor. Do you have a message for a certain individual or a group of people? Keep those private but still manageable. Employ ActiveBuilding in sending messages through SMS or email to persons of interest that only they can see. As such, you can let them know your concerns while maintaining an open line of communication with them. 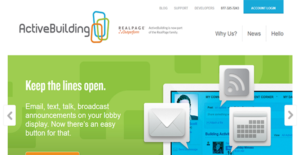 ActiveBuilding is a robust software that has a customer-facing portal. Through this, they can do a wide array of tasks that include lodging service requests. This way, you can prioritize maintenance and keep your residents satisfied. Moreover, the process can be done via the application, allowing you to eschew papers and save on time. Give your reception staff more time to do their critical tasks. ActiveBuilding can help you in that regard, by freeing them of having to manually manage packages. Instead, your personnel can simply log in the system the arrival of a parcel and it instantly notifies the recipient. After a resident has picked up their package, front desk staff can just note it on the interface. To tighten the security in your building, keep stringent track of your keys. ActiveBuilding simplifies the process as it automatically sends notifications to occupants when their keys have been taken and checked in again. This makes your residents accountable for their keys and lets you ensure that all keys are accounted for. Your residents’ safety and security is your responsibility as well as theirs. To assist you in making certain that every person in the estate is validated, ActiveBuilding has a guest management portal where profiles for dog walkers, cleaners, family and friends, and other authorized persons can be viewed by the front desk staff before anyone is let in the premises. Eliminate problems that come with the use of common space by residents. With ActiveBuilding, you can enable them to reserve an area for their own use beforehand. Because of the application’s tracking system, you can ensure that there are no overlaps in the reservation. Abstract the hassle of over-the-counter payments by empowering your residents to pay their dues online. ActiveBuilding is tightly integrated with RealPage’s payment processing capabilities to enable your tenants to securely automate and track their payments. If you are considering ActiveBuilding it could also be a good idea to investigate other subcategories of Best Property Management Software collected in our base of B2B software reviews. Companies have different needs and requirements and no software solution can be just right in such a scenario. It is futile to try to find an ideal out-of-the-box software product that fulfills all your business needs. The intelligent thing to do would be to customize the system for your unique requirements, worker skill levels, budget, and other elements. For these reasons, do not hasten and pay for well-publicized popular systems. Though these may be widely used, they may not be the perfect fit for your specific wants. Do your research, investigate each short-listed application in detail, read a few ActiveBuilding reviews, call the vendor for clarifications, and finally choose the product that presents what you need. How Much Does ActiveBuilding Cost? We realize that when you make a decision to buy Property Management Software it’s important not only to see how experts evaluate it in their reviews, but also to find out if the real people and companies that buy it are actually satisfied with the product. That’s why we’ve created our behavior-based Customer Satisfaction Algorithm™ that gathers customer reviews, comments and ActiveBuilding reviews across a wide range of social media sites. The data is then presented in an easy to digest form showing how many people had positive and negative experience with ActiveBuilding. With that information at hand you should be equipped to make an informed buying decision that you won’t regret. What are ActiveBuilding pricing details? What integrations are available for ActiveBuilding?